The Outer Church is seldom given to long-winded bloggery. Nevertheless, we're in the midst of what UFO experts would call a 'flap'... so here's an update on a whole mess of OC-relevant business. Broken20, the label founded by The Village Orchestra's Ruaridh Law has been super busy with new and forthcoming releases from Nanorhythm, Erstlaub, John Cohen and Isodyne. Check here for details. The B20 site is also hosting the tremendous Broken Strategy podcast by writer Warren Ellis, which is available for download here. Somehow Mr Ellis - currently nearing completion of his second novel Gun Machine - has found time to put together another excellent podcast entitled Spektrmodule 01: Fire Axes In Space which you can stream from his website here. 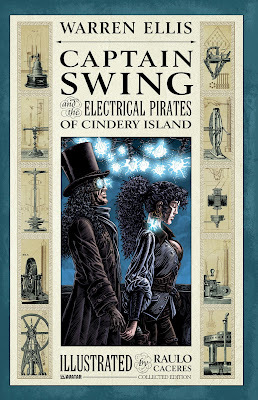 Ellis and artist Molly Crabapple are selling a beautiful limited and signed print, which you can purchase here. In the world of comics, his Captain Swing And The Electrical Pirates Of Cindery Island TPB (Avatar) is previewed by Bleeding Cool here and you can catch a peek of Marvel's Secret Avengers #20 here. The Outer Church travelled to London a couple of weeks ago to catch Warren in conversation with Lenny Henry (another OC hero) prior to a screening of excellent new documentary Warren Ellis: Captured Ghosts. 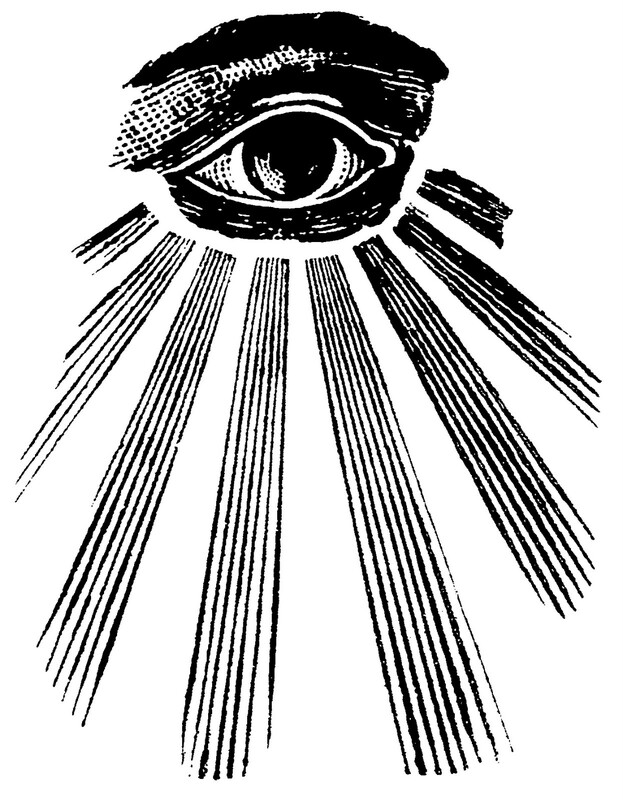 The film was made by the team behind Grant Morrison: Talking With Gods and is highly recommended. Check here. 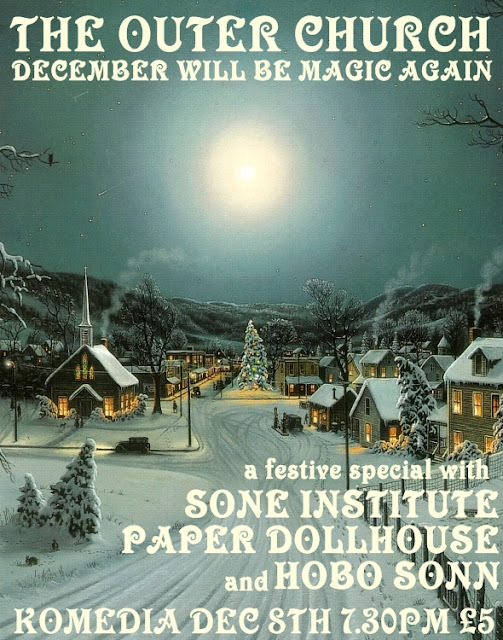 Paper Dollhouse will be playing the December 8th edition of The Outer Church along with Sone Institute and Hobo Sonn. Her sparse, melancholic debut album is set for release three days prior on Bird/Finders Keepers. OC faves Old Apparatus have been grafting away in the overheated engine room of their collective imagination, putting together the Chernobyl Mixtape for Big Up Magazine (DL here) plus a triffic mix for the Electronic Explorations site (DL here) groaning with new and unreleased material. There's even a new track entitled 'Hand To Mouth' to download here. Raime's long-awaited new 12" Hennail is available now, details here. Pye Corner Audio have one side of a Ghost Box Study Series 7" devoted to them, info here. Embla Quickbeam has a marvellous new release on Chocolate Monk, entitled 'Seven Is The Rhinog's Crown' and limited to only 50 copies. Quick! Get one here. 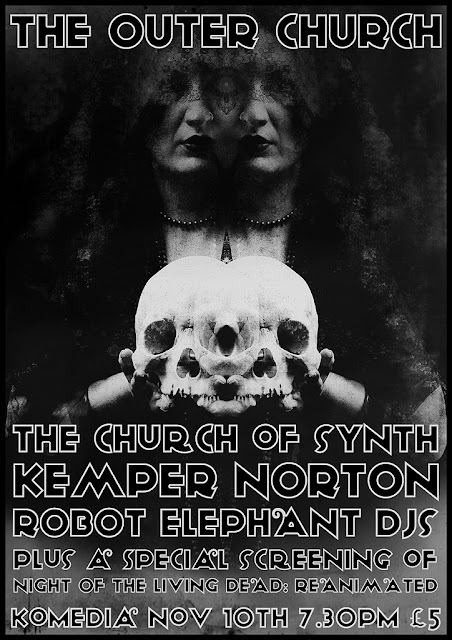 The Outer Church will soon be sprouting an as-yet-unnamed extra wing in the form of a show on London Fields Radio. This will involve music but also interviews and deranged ramblings on a variety of subjects including film, books, comics, art and mental illness. Finally... those blasphemous rumours are indeed true. Following December 8th's festive shenanigans The Outer Church will be vacating Komedia for good and relocating to new venue Sticky Mike's Frog Bar. The benefits? Well, extended opening hours and more volume (incl. subs) for starters. The reboot takes place on January 20th... and will involve some of the folks I've mentioned above. ...oh, and more power to the Occupy movement! 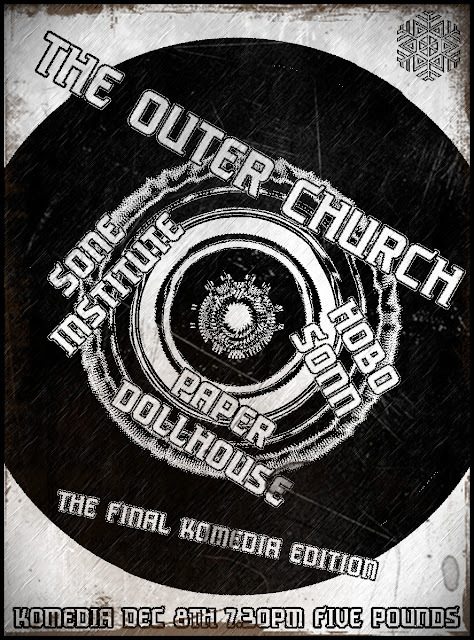 I've decided to dust down the headphones for the Dec 8th edition of The Outer Church. This is one of the tracks I intend to play, in all its 11min 36sec glory.